Japan’s Hayabusa 2 spacecraft zipped past Earth on Thursday, one year after the probe’s launch atop an H-IIA rocket. The Earth Flyby was set up to boost the spacecraft’s velocity and set it on a course towards asteroid Ryugu where it is due to arrive in mid 2018 for a half-year stay. 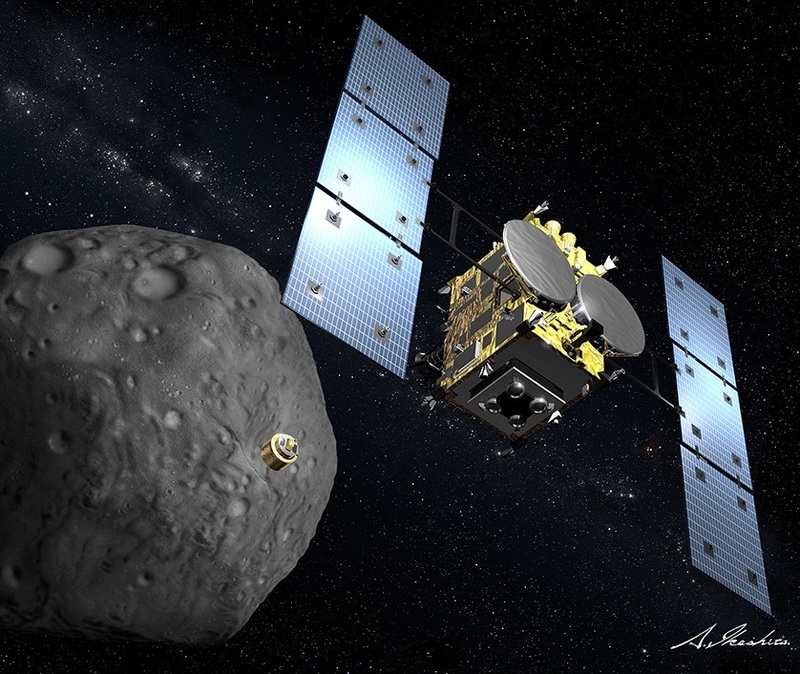 Hayabusa-2 is expected back on Earth in late 2020, bringing with it precious sample material collected during a series of short touchdowns on the asteroid’s surface. 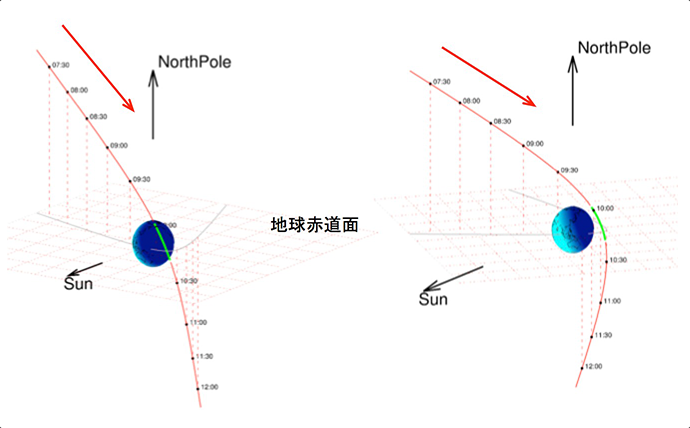 The 550-Kilogram spacecraft conducted three propulsive maneuvers using its ion engines for a total operation of three of the four engines around 523 hours in March, June and September – fine-tuning the vehicle’s orbit around the sun to set up the Earth swing-by. 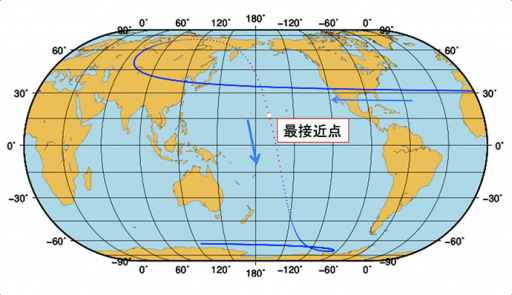 In early November, Hayabusa 2 conducted a Trajectory Correction Maneuver of four seconds using its chemical thrusters with another one-second burn on November 26, setting up the final path taking the craft past Earth. On Thursday, Hayabusa 2 was inbound for its flyby, being tracked by NASA’s Deep Space Network and ESA Ground Stations as well as Japanese tracking assets. 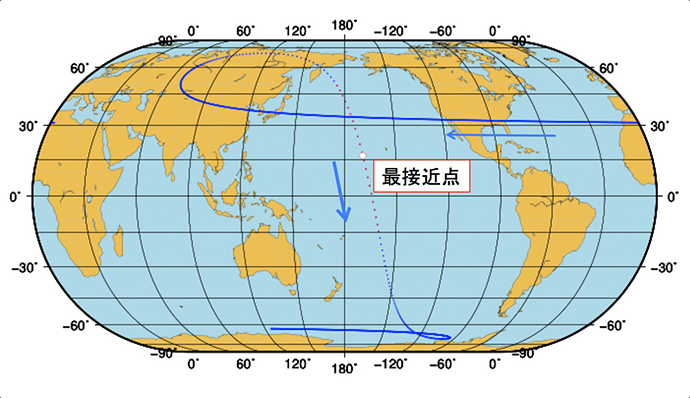 The expected trajectory took the spacecraft to within 3,090 Kilometers of Earth, closest approach taking place at 10:08 UTC when the spacecraft was over the Pacific Ocean, just west of Hawaii. The flyby marked the first time the spacecraft had to endure darkness and the associated thermal change. As part of the Flyby, Hayabusa 2 operated its various instruments as an exercise for operations to be conducted at the asteroid. 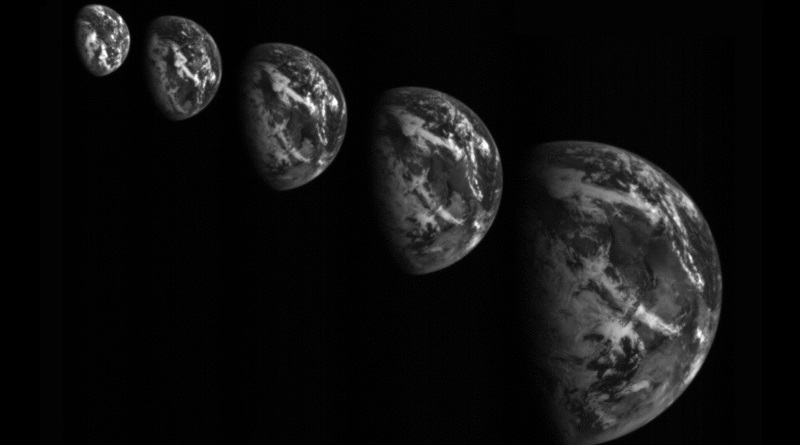 The ONC-W Wide Field Navigation Camera was employed to deliver black-and-white imagery of Earth. 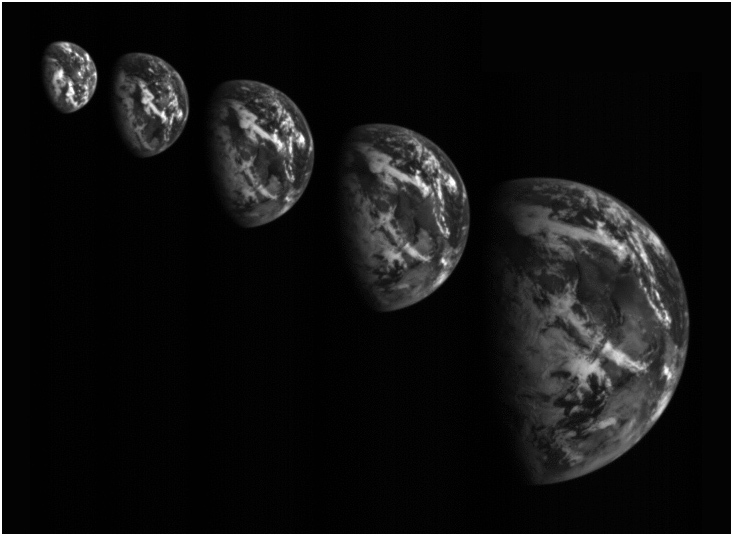 The composite image and animation displayed in this post were taken on the inbound leg starting around 200,000 Kilometers up to a distance of around 36,000 Kilometers, matching the altitude of Geostationary Satellites. Additional images are likely to be released over the coming days. Hayabusa’s systems performed well throughout the flyby, but it will take around one week for tracking of the spacecraft to reveal whether it reached the correct orbit around the sun for its intercept of Ryugu that itself is found in an orbit of 0.96 by 1.42 Astronomical Units. Hayabusa’s target is about 920 meters across and rotates once every 7.6 hours, belonging to the C-type class of primitive bodies in the solar system, believed to hold a significant amount of organics or hydrated minerals and may have played a role in the delivery of organics to Earth – therefore making Ryugu an exciting target for a sample return mission. The primary payload of Hayabusa 2 is a sample collection system that will acquire small amounts of surface samples during brief touchdowns of the main spacecraft on the asteroid’s surface using a high-fidelity navigation system that allows the spacecraft to make contact with the surface just long enough to shoot down a projectile that causes an ejection of dust for collection by Hayabusa. No information has been posted on the progress of the Earth flyby of Procyon, Hayabusa’s smaller companion that can no longer reach is target asteroid after an ion engine failure.